The photo allegedly features a taxidermy specimen. THE WINNER OF a prestigious wildlife photography competition was today disqualified after organisers said it was “highly likely” the anteater depicted was a stuffed specimen usually on display at a national park visitor centre. 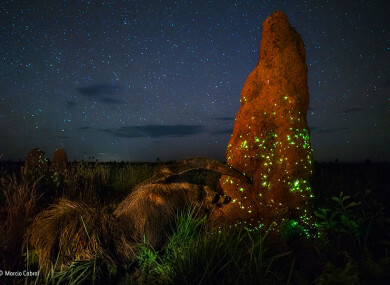 An image showing the animal eating from an ant hill in Brazil’s Emas National Park had won an award at the Wildlife Photographer of the Year contest in London’s Natural History Museum last year. The striking image, called The Night Raider, was taken by Marcio Cabral and won the Animals in their Environment category. “Evidence was presented to the Museum by third parties that it is highly likely the animal in the awarded photograph is a taxidermy specimen,” the museum said in a statement. “After a thorough investigation, the Museum concluded that the available evidence points to this allegation being true,” it said, adding that competition rules state that “entries must not deceive the viewer or attempt to misrepresent the reality of nature”. The museum said it had been contacted by “anonymous sources” in March questioning the authenticity of the image and had asked animal and taxidermy specialists to investigate the claims. The evidence included photos of a stuffed anteater on display at a visitor centre in the park where the image of the anteater was taken that closely resembled the winning entry. The museum said in a statement that the experts had “concluded there are elements of the animal’s posture, morphology, raised tufts of fur and patterns on the neck and head that are too similar for the images to show two different animals”. The museum said Cabral had cooperated with the investigation and strongly denies the image he took was of a stuffed animal. Email “Photographer disqualified from contest as winning image features 'stuffed' animal”. Feedback on “Photographer disqualified from contest as winning image features 'stuffed' animal”.